We currently now field only one team of 6 players in The Berkshire Chess League. Our league matches for the 2018-19 season have now finished. On 26th March we were 2nd but teams close behind us have matches to play, so we expect to finish mid-table. You can see our results table (PDF) or go the Berkshire Chess League website for league tables, details of clubs and match cards (which show individual board results). For several years we had two teams with Newbury 'A' playing in Division 1 whilst the B-team variously played in Divisions 2 or 3. Players nominated for the A-team could not play in the B-team, though any other registered Newbury player could play in the A-team. At the end of the 2016-17 season, the A-team got relegated to Division 2 and the B-team promoted to it from Division 3. So, although attempting to field two teams in 2017-18 we merged the two teams at the start of the season. Information about the progress of the A-team is below. Go to the B-team page for details of its performance over the years of its existence. B-team - main page: Each season's highlights from 2008-2013; and its reincarnation from 2015. Results tables: Annual summary tables for both league teams and for the Club Championship. Ben Dyer (147) - Ben formerly organised our club championship and was a regular, but work committments means he only plays for us rarely. Brian Medhurst (138) - A long-term member, Brian is often more committed to bridge that chess! David Skyrme (106) - the captain, but since his chess never seems to improve, he often does not get to make the team! Keith Savoy (89) - our honorary chairman who has played regularly over many years. The presence of a mobile phone does not automatically disqualify you. Exceptions are made for match captians helping team members find missing players and for those needing to receive message from their employers (must use silent mode). Moving before recording moves does not lose the game. But moves must be recorded as soon as a move is played. Similarly, you are allowed to record moves in non-algebraic notation, e.g. "P-K4"
There are league specific rules about eligibility for teams, determining final league positions, rescheduling matches etc. Clocks are used. 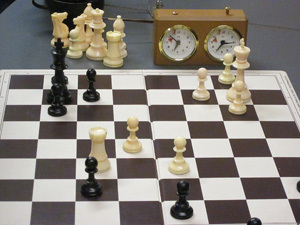 The default time limit for each player is 30 moves within the first 75 minutes and all the remaining moves in a further 15 minutes (for digital clocks the time is 75 minutes with 10 seconds being added automatically after each move). However, for simplicity (and particularly since we do not have digital clocks) four our home games most teams agree to play with a time control of 90 minutes for all moves. There were 5 teams in Division 2. Each side played each other, once at home and once away. The away team has white on odd numbers boards. * Newbury score is shown first. Played: 8; Won: 3; Drawn 3; Lost 2. Match points: 4½. 2nd out of 5 in league table. For details of individual matches go to The Berkshire Chess League website; click on teams; Newbury; Match Cards. 2016-17 Season: Not One To Write Home About! Newbury's place in Division 1 is a bit like newly promoted football premiership teams working hard to avoid relegation. Although we held in there last season, things proved trickier this season. We narrowly lost of first two matches which gave us hope for the future. However these results were followed by two 6-0 defeats in December and we struggled after that. At least a couple of matches were hard fought and the final result does not convey how close we were to winning. We await to see if we will be relegated or not. There were 10 teams in Division 1. Each side plays all other sides once, either at home or away. The away team has white on odd numbers boards. Played: 9; Won: 1; Drawn 1; Lost 7. 9th out of 10 in league table. Having won Division 2 in 2014-15 with a 100% record, it was never going to be easy for the A-team to hold onto its position in Division 1. It's a bit like football championship teams getting promoted and working hard to avoid relegation. After all the average grading for teams in Division 2 is around 130-140 whereas teams in Division 1 typically have average grades in excess of 160. As anticipated it did prove challenging. And so it had proved in our first match where we lost 4½ -1½ to Reading A. Things didn't improve when we were thoroughly beaten by Sandhurst at home 6-0. However, all was not doom and gloom. We did have two wins and a draw so just avoided relegation, finishing 7th out of 9. Our main aim this season was to stay in Division 1 and this we achieved. There are 9 teams in Division 1. Each side plays all other sides once, either at home or away. The away team has white on odd numbers boards. Played: 8; Won: 2; Drawn 1; Lost 5. 7th out of 9th in league table. This year we again played in Division 2. We welcomed to the club Andy Robbings (grade 175) who had previously played for Crowthorne A but has moved to the Newbury area. Also returning was Jim Delderfield (est 120) after a gap of 3 years, now that he is fully retired. Boosted by a strong selection of players to choose from, we won every game we played (10 out of 10 and 44 games to 16), so topped the league table and won the FS Woolford Trophy. This despite our policy of giving every player, whatever their grade, a chance to play on the bottom two boards. Our nearest rival was Reading C, who came second with 6.5 points. * Newbury score is shown first. Match points: 10. Game points for: 44; against: 16½. Of the players who payed 5 or more games, the best performances were from Ilan Dwek (7½ pts out of 9 games), Andy Robbings and Danny Sparkes (both 5 out of 6). Congratulations to them. Division changes since last year are the entry of Eton College A (relegated from Division 1) and omission of Sandhurst B (last year's winners), so again 6 teams. We played one home and one away game against each opponent. Summaries for earlier seasons (from 2007-14) will now be found on the A-team archive page.